DJ Mnx (alias Manue Dawar) started his career as a DJ in the clubs of his hometown in Northern India in 2005 which laid a good platform for his own electronic music productions. He soon experienced a kick start with some major label releases which laid the foundations for various endorsements, shows and a growing fan community. But his personal satisfaction came when he had his first deep meditation experiences and started producing new age music. He never took any classes neither for music production nor for meditation. “Meditation is never taught or done, it happens” are his words. On his travels from 2010, DJ Mnx experienced many live sessions with different people and he conducted counseling sessions, meditation classes and anti stress/drug de-addiction camps. These sessions were taken only with music and the understanding for notes and scales came while discussing other people’s problems. As Buddha says, don’t believe me. The emotion shaped within the music tracks under this series of albums is intended to create a process of thought in one’s mind which will help overcome what other people say and encourage to explore what is real, the truth. Discover the natural and the virtual world. Feel the intensity of an emotion, adapt virtuous things and embrace them for good. 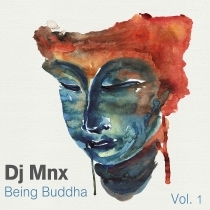 “Being Buddha Vol.1” is created with a smooth ambiance and the sounds encourage love. Love for human and nature and it is overall a relaxed experience. The music instruments used in these tracks are sitar, piano, Jazz drum kits, e-piano, flutes, saxophone and tabla – with contributions of several people from around the world.